CRGA has a long-standing relationship with Anne Arundel Medical Center, having completed hundreds of projects for the healthcare system. Most notably, CRGA designed this 290,000 SF, eight story Acute Care Pavilion addition to the existing hospital, which was awarded the status of the first LEED Gold hospital in the state of Maryland. The lower level of the addition contains a number of support functions including the Clinical Lab, Materials Management Department and Central Sterile Supply. The new Clinical Lab was designed for flexibility and the future utilization of robotic dispensing units. The first floor includes fast track, emergent and clinical decision pods. Other spaces within the ED include a large pediatric ED with inpatient rooms, specialty rooms for trauma, OB/GYN, psychiatric services and decontamination. The entire unit is immediately adjacent to radiographic, CT and MRI rooms to allow for quick turnaround of required imaging services. The second floor groups the Surgical and Interventional Procedures Suites around a common PACU/Prep-Recovery Unit for staffing efficiency and patient comfort. The Critical Care Unit is located on the third floor with the Respiratory Therapy Department and the Clinical Pharmacy immediately adjacent, facilitating the important interaction of these three departments. The fourth, fifth and sixth floors contain Med/Surg Units. On each floor, private patient rooms are located on the building perimeter and a large core area contains patient support services. For instance, the Physical Therapy Department is located within the core area immediately adjacent to the Orthopedic Unit. The project includes a “state of the art” information systems backbone. Much of the medical equipment utilized throughout the facility is also on the leading edge of technology. All radiographic equipment is integrated into a PACS system. 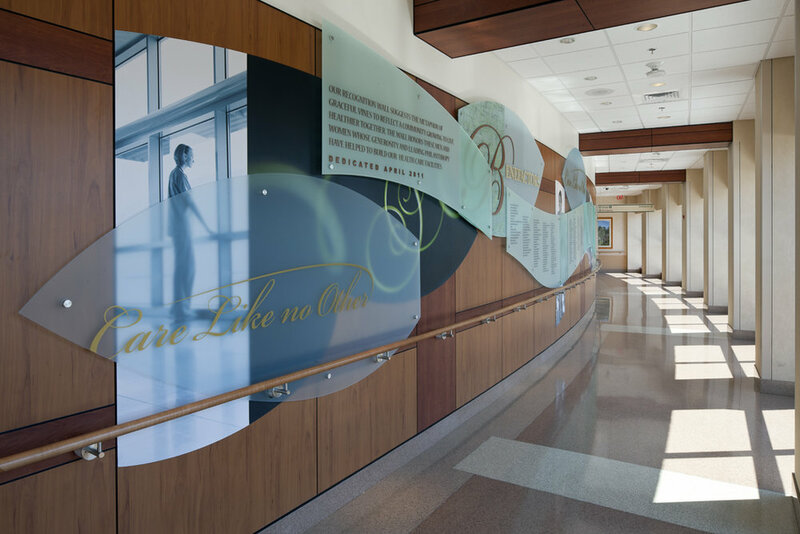 Our design focused on the need to create a very caring environment for patients, families and staff. Patient privacy throughout all units and departments was a major design consideration. Equally important was the desire to incorporate the needs of family members and provide amenities supporting these individuals throughout the stay of their loved one. A Restorative Garden, immediately adjacent to the Acute Care Pavilion, provides a peaceful, meditative space for patients, families and staff. Anne Arundel Medical Center’s South Tower project included two green roofs, rain gardens, step ponds and retaining walls to protect the Chesapeake Bay, windows that are coated with a high gloss glaze on the exterior, paint and adhesives with little or no VOCs, recycled materials throughout and recycled construction waste, low flow water fixtures, high efficiency chillers, chemical free cooling towers, LEED certified chemicals and microfiber mops for cleaning, reusable pillows and containers, mercury free instruments, organic food and a farmers market on campus and energy star computers. CRGA was the BIM manager for the project team. Energy modeling was provided by the MEP engineer. The facility received the Maryland Trailblazer Award for its commitment to pollution prevention and demonstration of environmental leadership, and was recognized by US Green Building Council for “LEEDing the Way for Healthcare.” Most notably, this project was awarded LEED GOLD certification by the USGBC, becoming the first LEED Gold hospital in the state of Maryland.